The VCU Rams are playing ridiculously good basketball right now. Not only are they taking down BCS teams but they are thoroughly handling them on their route to this year's Final Four. Even if you don't like VCU you can't help but be amazed by what they are doing right now. George Mason in 2006 certainly blazed the trail for teams like Butler and VCU and mid-major conferences are continuing to show there isn't really anything "mid" about what they can accomplish in March. It certainly is a boost for the CAA to get another team in the Final Four five years after George Mason's historic ride but that's not the only thing VCU and George Mason's tournament runs have in common. Weak Finishes. Both teams didn't end the regular season or CAA tournament on the best note. George Mason lost twice to Hofstra down the stretch and was eliminated from the CAA tournament in the semifinals. VCU this season lost their last four conference games and was then beaten by ODU in the CAA championship. Win over Wichita State in the Bracketbuster game. Both VCU and George Mason played at Wichita State in ESPN's Bracketbuster Weekend and both times it was their best out of conference win on their resume heading into Selection Sunday. You can make an argument that both times it was basically a play-in game for each team to make the big dance. At-large #11 seeds. Neither team won the CAA auto-bid and they are two of the three #11 seeds to ever make the Final Four. Criticism from the media on Selection Sunday. Who could forget Jim Nantz and Billy Packer grilling the selection committee for the selection of George Mason back in 2006. This year it was ESPN's Jay Bilas who openly criticized VCU and UAB in the field of 68. Both times they said that the two teams didn't have any "good wins". Here is a compilation of ESPN guys dissin' VCU from Selection Sunday. BCS schools taken down. It seems like VCU has beaten almost every BCS conference already: PAC10, Big East, Big Ten, ACC, and Big 12. In 2006 the Patriots took down the Big Ten, ACC, and Big East on their path. If they had the First Four back in '06 and Mason was in that it they probably would have been matched up against another BCS team as well. Pregame Elite Eight trash talk from future NBAer that motivated them. Some people might not remember this but Rudy Gay said something to the Mason players before the UConn-George Mason Elite Eight game. Towards the end of the game Tony Skinn reminded Gay of his pregame comments as he walked up to the free-throw line. Yesterday during the pregame hand shakes one of the Morris twins from Kansas said "You guys had a nice run, but it's time for y'all to go home." Beat #1 seed to advance to Final Four. #1 UConn in '06 and #1 Kansas this year were both heavy favorites despite how good George Mason and VCU were playing in the tourney. Defense is the backbone. George Mason and VCU would not have gotten to the Final Four without their exceptional defense throughout the tournament. VCU's is playing so good lately that we could see them in the national championship game. The 2006 George Mason team probably relied on it a little more as they were not as athletic as these 2011 VCU rams are on offense. But still coaches Jim Larranaga and Shaka Smart both used effective defensive schemes that really frustrated these BCS teams. NBA talent? I just thought it was interesting that the 2006 George Mason team had no guys do go to the NBA and most likely this year's VCU's team won't either. Last year's Butler squad that went to the national championship did have one in Gordon Haywood. I just found it funny that VCU has had two 1st round NBA draft picks recently and yet the season they don't they make the Final Four. You missed another one - Hofstra got snubbed. '06 Hoftsra thought it deserved the at-large bid. This year, Hofstra finishes AHEAD of VCU in the standings, but cant even get an NIT bid. Its weak, but I bring it up because @defiantlydutch hates Mason, but has now become VCU's biggest fan. Great post. What were the Rudy Gay comments? Don't remember that at all. Much as I dislike VCU, it's awesome to have another CAA team making a run like that. When you also add in the fact that we had three teams represented, and that Mason scored a Big East notch of their own, it's been a pretty damn successful tourney for the conference. Great for VCU and for the CAA. I just wish ODU could have made a shot at the end of that Butler game... that region was ripe for the taking. ODU / VCU Final 4 would have been pandamonium. VCU will lose 4 seniors (Rodriguez, Skeen, Rozell & Nixon) after this season with only 2 juniors returning (Burgess & Veal) ..... how does this compare with Mason's line-up/outlook after the 2006 Final Four Run? Different styles but oh so similar results. We just could not shoot in a dome and the Gators could. Just think players at the GMU,VCU level listen better,know quickly how good the BCS team is plus attack instead of retreat. Just wish it was not Butler-VCU, rather each being the underdog. It would be nice if either won then perhaps this Mid-Major tag would go away. One more note I have not heard mention of Larry Sanders yet if it were a BCS school that would be news that he had one more year. CAA wins this year big time whatever happens. Bill they will also lose their coach (99.9% chance). He is the young up and coming darling of NCAA Basketball, right now. I think we only lost two seniors, but they were each key players. We should win about 21-24 games next year before the NCAA Tourney, IMO. VCU showed something different in that CAA tourney game vs. GMU. Their defense was smothering. That defense didn't exist when we came from behind to beat them a few weeks prior. The reason VCU and Mason can win without any NBA talent is because they were/are teams of 3rd and 4th year players that played well together and D people up. Big schools with NBA talent see that talent leave after 2-3 years. They teams never have 4-5 players that play together for 3-4 years. That is why mid-majors are starting to get deep into the Dance. Kindda like when the USA would lose in international games after the original dream team. We were way more telented than everyone else but that team had no chemistry and the international squads we played had together for years. Mid-Majors with good coaching and good D can win now, as long as they get hot and knock down clutch shots. 15 years ago that was not possible. 1 & dones and 2 & dones have closed the gap between BCS and mid-majors. IMO It has made NCAA b-ball way more exciting and less predictable. The best possible scenario for the CAA improving as a league is not VCU winning, but Shaka staying, a la Coach L. I have hope...GT, UT, Arkansas jobs filled...coach from Richmond signing a big extension. It could happen. I'll let Ryan have the honors of being the first to discuss what might lie in store for us and the CAA next year, but suffice to say I like where we are positioned with three great seniors and a bevy of talent underneath them. And VCU will likely take a step back while they regroup, but not for long since their recruiting abilities will ramp up the way ours did after 2006. All in all, I think any team in the CAA will be able to recruit better given the awesome successes Mason and VCU (and ODU) have had in the tourney. Shaka could stay. Here's why - what jobs out there are worth taking? VCU could pay a boatload of money and commit to building a first class basketball program (like Mason and ODU). Shaka has an opportunity to build a solid name and not become a one-hit wonder because he has to start from the ground up at a down school in a top heavy league (NC State or Tennessee). He's only 33. Why not take the challenge of building VCU into a Butler or Gonzaga and wait for a much better situation (like Anthony Grant going back to FL before Billy Donovan screwed him)? VCU has some good young players and this wont hurt his recruiting classes. He's not going to be a losing coach any time soon if he stays. One additional note of similarity--Jay "Bias" was among the GMU haters in 2006, not just Packer and Nantz. Indeed, Packer admitted in the Final Four he was wrong about GMU--Bias wrote in an article on espn.com the next year he was still right, just as he has argued re: VCU. This has been one the strangest tournaments I’ve ever seen. VCU’s win sets up a historic game with Butler, two unranked teams in Final Four game. This occurrence says a lot about college basketball today, anyone can win it all. The talk in Richmond is that Shaka is staying. Many of the big college jobs are already filled and Norwood Teague will do almost everything including naming buildings after Smart to get him to stay. Many of the talk radio heads down here have close relationships with Smart and he doesn't seem interested in leaving. Moody is locked up for 10 more years at U of R.
I am surprised at what VCU is doing as much as the next person. I thought they would have won the CAA at the beginning of the season with their play in the NIT and other big wins. I think that the injury to Rozell really shook them. It took them 5 games to get themselves back together and they really blossomed during the CAA tourney. I will not be pulling for them though. I am a MASON fan and not a CAA fan. I would never pull for another CAA team. To me it would be like pulling for the Redskins in the Superbowl. I am a Cowboys fan and would never pull for another team in the NFC East. Now I am also a basketball fan and as that I can pull for a great game and appreciate a run such as what VCU is doing but I am hoping they lose every game. As far as NBA talent on VCU I could see Skeen moving on. He has the size at 6' 9". He has a jumper and inside play. He also has the D ability. I will say that he is an important player in the VCU system. In many of their losses he was not the focus. I most of their wins he was the leading scorer or one of them. I agree with Mooky. I can't believe some of you are rooting for VCU. The CAA will never get the respect it deserves. We will always be an average mid-major in the eyes of everyone no matter what happens. VCU's run to the Final Four not only lessens our place in history, but their recruiting will no doubt take an up tick. They are our arch enemy at this point, and nothing makes me more happy than us beating them. Our win at VCU brought happy tears to my eyes!! They have had our number over the past 5 years and now that might continue. I hope Butler kills them and embarasses them in the Final Four. I just can't believe they have shot 48% or better from 3 point range in the four games they have won. I fear they might win it all, but hopefully they will be brought back to reality..... a team that finished 4th in a mid major conference. I agree 100% with you Mooky_13d! I am a mason fan and will never root for VCU since they are the team I most despise. I was actually rooting against them for the last two weeks. Their impressive run has stole Mason's glory and if they win next Saturday there will be no more George Mason reference guaranteed! 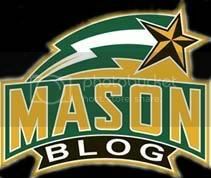 As it stands now their little run has already been compared to Mason's and their fans are so cocky that they happily report that unlike GMU, who averaged 2.5 points per win during the 2006 tourney, they averaged 11.5. Why would I root for some arrogant bastards? Yes this was good for the CAA but bad for Mason. A REAL FAN KNOWS THAT SCHOOLS BATTLE FOR RECRUITS, ESPECIALLY AMONG CONFERENCES. How well this hurt us, their coaching staff will use this as a recruiting tool and argue that unlike Mason, they beat more teams and did it with ease! VCU I hope you choke to Buttler! Signing off the mother freakin Mason fan who hates the lambs, I mean the Rams! I also agree with you and was emotional when we beat them. The only smart people on this blog are those who realize how this will affect George Mason. Spare me the CAA bullcrap. There are only two team I root for GEORGE MASON AND THE TEAM THAT PLAYS VCU EVERY WEEK!!!!!! I disagree that VCU's run (a) hurts Mason or Mason's recruiting, and (b) lessons our place in history. Reasoning for (a): what happened after Mason made it to the final four? Did we suddenly become rich with 4 and 5-star talent while the rest of the conference regressed? Did we instantly turn into a perennial contender? No, we didn't. It was a marginal bump. If anything, you could argue teams like ODU and VCU benefited more / attracted better talent because we put the CAA brand on the map. The entire conference benefited from our run. My prediction: when Pearson, Acorn, and Morrison leave, we'll see Mason's best recruiting class ever, largely because (1) VCU elevating the CAA brand, (2) Mason's tourney victory over Nova and our continued name recognition, and (3) potential recruits no longer have to worry about the "oh, you're that random team in a small conference that went to the final four a few years back" stigma. I totally disagree that we'll always be considered an average mid-major team, too. The Big East didn't become the best conference in the country, top to bottom, overnight. It took time, and it took expansion. At the very least, there's no reason why we can't be the Gonzaga of the east, going to tournaments every year for the last 13 and sending guys regularly to the NBA. Reasoning for (b): we were, and always will be, the first to do it. I can't pinpoint why, and perhaps I'm biased, but it doesn't seem like the nation is in love with VCU the same way it was with Mason. Same w/Butler. Bilas is as stubborn as can be...he will never admit he is wrong. Not to take the side of VCU but Mason was criticized for even making the tournament but then that was all washed away when we went to the Final Four and you don't really hear about it now. It seems like no matter what VCU does though it will always be brought up that VCU didn't belong. I agree with you Justin. Comparing rooting for VCU is like rooting for the Redskins is absolutely ridiculous. If the Redskins win it all it doesn't make free agents that next season say "hey I want to go play in the NFC East because that's where the champion is from!" Professionals are on a whole different level. But I guarantee you that some high school recruits watch these games and say hey the CAA has gotten 2 teams to the final four in the past 5 years they are obviously just as competitive. Even if these recruits don't come to Mason they come to other CAA schools and raise the bar for the league. How could you root for a powerhouse team like Kansas or Purdue when you can have our conference represented well. You may be a Mason fan and not a CAA fan but they go hand in hand. How could you not watch all these analysts ripping on our conference and not want VCU to represent it fully? I have to respectfully disagree with both of you. I will continue to hate (even despise) VCU during the regular season, but this isn't the NFL, the NBA, or college basketball among the power 6. At least on those levels, the resource allocation is relatively similar among schools/teams. The reason the VCU/Butler runs are so impressive is that they, like us, have significantly smaller budgets and vastly outmatched players. Even coming from a huge VCU hater, this run is awesome to watch. Plus, I would argue that VCU's run actually __helps__ Mason, in three ways. First, even single article about VCU references Mason. It never hurts to get free publicity. Speaking of free, VCU has netted something like $10m for the conference in its last 5 games. More money = more scholarships. Finally, the 3 bids the CAA got is great for Mason's recruiting. Coach L can now legitimately point to the bids and say hey, we don't have to win our conference to get respect for the committee. No longer do GW (A-10) or Maryland (ACC) have a leg up on us recruiting-wise because we don't receive the bids their conference does. This is huge, because we're constantly competing with those places for recruits from the DMV area. I was torn after the Second Round whether to root for VCU. I ultimately decided to, but man their fans make it difficult. For a school that has our number they really do have a little man syndrome when it comes to comparing themselves to Mason. I think I will root for them against Butler but not to win a championship, VCU fans would crow about that forever. For what it's worth, I don't think they are beating Butler. Wow, Rather interesting the comments placed here about why or why not we should root for or against VCU. To think this might just be a sign our conference has arrived when the average fan compares this to the NFL and just how much they despise the success of a team from our conference. Never knew how deep rooted that level of interest was. No real argument here since it is a free world and no matter how one feels he or she can say what they want. I could be wrong but the 2006 team set the stage for every team considered a Mid-Major or really not relevant. If some one were to come up to you today and say you were not good enough to not only do your job but almost anything it might just motivate you. That feeling is what carried Mason and VCU and it comes from people who find it so easy to proclaim the world of BCS(sometimes I would like to leave the C out). What Mason and now VCU have done is to excite the country and make them aware of not only their teams but also a very good conference. Had these runs along with Butler not happened we all would be relegated to the world of Basketball obscurity. I disagree with those who say our recruiting didn't pick up after the final four run. Dre Smith said as much. Coach L talked about not having to explain what George Mason was and having players come to him. The same, or maybe even more, will happen to VCU, I'm afraid. They will draw on the final 4 run (and more?) plus the Mason final four -- that this is a definitely a conference on the rise. Mason will get a bump as well, even ODU and others. But I worry that VCU will now become the flagship team of the conference. For that reason, I was okay with them winning 2 or 3, but not beyond that. I hope they go no further, though it won't be the end of the world if they do. We'll all benefit. No matter what happens next weekend, I think next year will have a lot to say about the conference. I'm looking for VCU to fall back some (like we did in 07), and I think we are poised to repeat as champs, and then hopefully win the tourney. I also think it is high time the ncaa starts recognizing how undervalued the mid major conferences are. If we got a little more credit at the beginning of each season, then wins over fellow mid major teams that were formerly perceived as middling will now be seen as "good" wins. Plain and simple the CAA and others (but especially us now) need to be calibrated higher. Whatever flaws the RPI might have, it time and again points out the value of mid major wins -- which is why the pundits are always trying to diss it. I think the RPI gets it right, or at least more right than the pundits who set the top 25. And of course our last element of proof is the success of midmajors in the tourney, especially in the last half-dozen years. Gonzaga ripped the door open, Memphis jammed the door to the wall, then George Mason barged right in, Davidson came in and checked the place out, Butler followed in and made itself right at home, and now VCU just waltzed in for a visit, and one of those last two just might proceed to eat all the food, drink all the beer, and leave a big stinkin' mess! Don't know about VCU not having any "NBA" players. Jamie Skeen will now get a LONG look from NBA scouts and he has a decent chance to be a second round draft choice. His game in particular has matured greatly over this past season and while he's not a dominating athlete for the NBA level he's a solid, versatile 6'9" inside/out player who could stick around and become a solid role player off the bench for several years. I just simply dislike VCU from TOP to BOTTOM. Thru their entire final four run, there was not a single time did that Shaka mention CAA. This is a guy who has no interest in CAA and will not stay in CAA by the end of next season. This is somewhat late and off the track of whether or not to root for VCU, but I just wanted to comment on the psychology employed by Shaka Smart and how Coach L. and Mason could perhaps use this in the future. I think it's safe to say that VCU was always capable of the run they made, but now that I've read more into it I believe that Smart's coaching, and the circumstances, had just as much to do with the VCU run. Before each game in which the major media outlet pundits were picking VCU opponents, Smart compiled tape of media critisism and played them for the VCU players before the games. Psychologically that is just good coaching. He stoked them and in essence made them choose: are you going to lay down to these insults or rise up and play the best team basketball of your lives? It's obvious which road VCU took. When VCU made the final four, and all of the major media outlets started saying it was an open field, I had a gut feeling that VCU was doomed. What was Smart going to do, manufacture fake tape with pundits dissing his team and favoring the opponent? I remember driving around and listening to the radio hosts in the area saying it was open for VCU. I was hoping that the VCU players were put on a media restriction by Smart, because if they heard enough of that stuff they were done. (full disclosure I was rooting for VCU because any success they made braought more clout to the CAA and Mason is a serious contender to produce a tourney team in many years to come out of the CAA once it gains its recognition in consecutive years). VCUs tourney opponents (and all of our CAA teams' tourney opponents for that matter) are typically bigger, longer, etc., etc., but where we have the advantage is our team spirit, and lack of 'one and dones'. Smart eloquently manipulated this trait by psychologically motivating this team of four seniors to stand up for themselves and represent as a unit. But, once the underdog mentality was lost I believe so where they. I know there are other the factors of tired legs and the pressure of the big stage, not to mention how tough Butler is defensively, but VCU had a week to drink the major media cool-aid before the final four and if that's what they were doing then I believe that had to be what slowed their roll, psychologically.